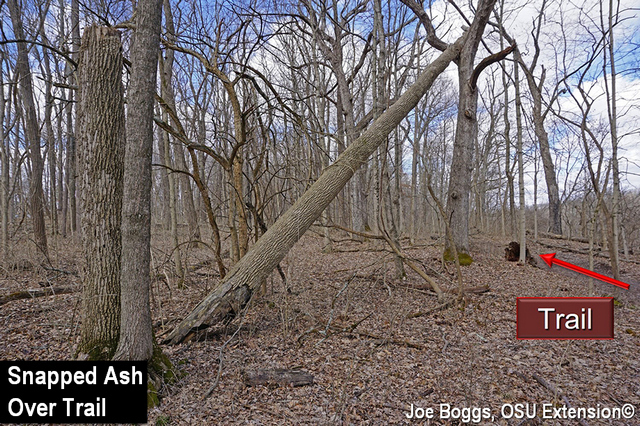 During our BYGL Zoom Inservice today, the group discussed the continual hazard presented by ash trees that have been killed by (EAB,Agrilus planipennis). 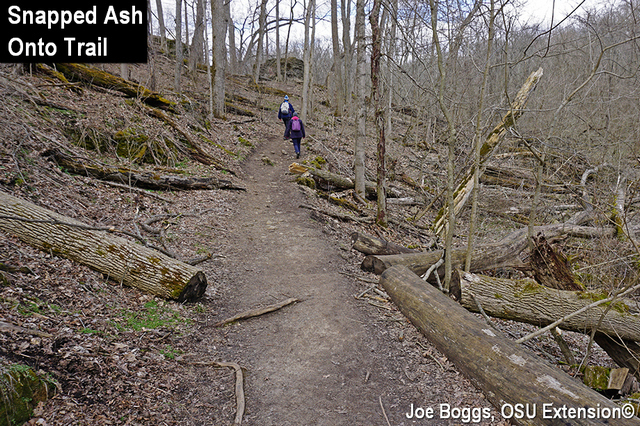 Participants located throughout Ohio noted that walks in the woods remain a serious risk with dead ash trees breaking apart or toppling over onto walking trails. The point was driven home to me during a recent hike in a nature preserve in southwest Ohio. 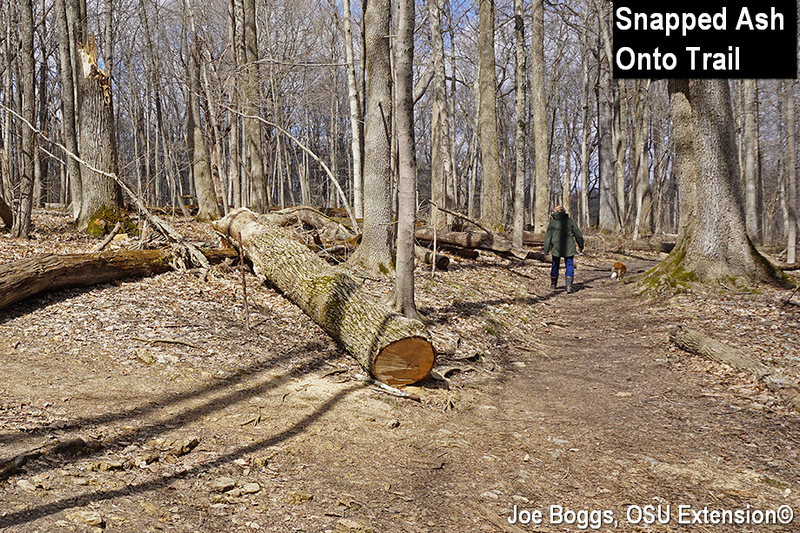 The number of broken or fallen trees – both large and small – was dramatic. 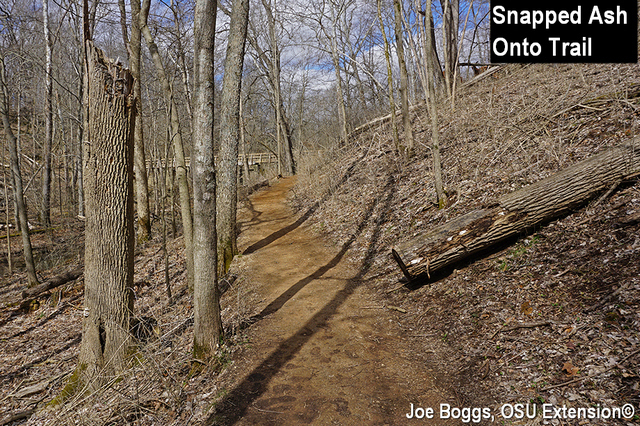 However, what was most frightening were the number of hazardous EAB-killed trees that remained standing next to or within falling range of the hiking trails. The trees had been dead for a number of years. 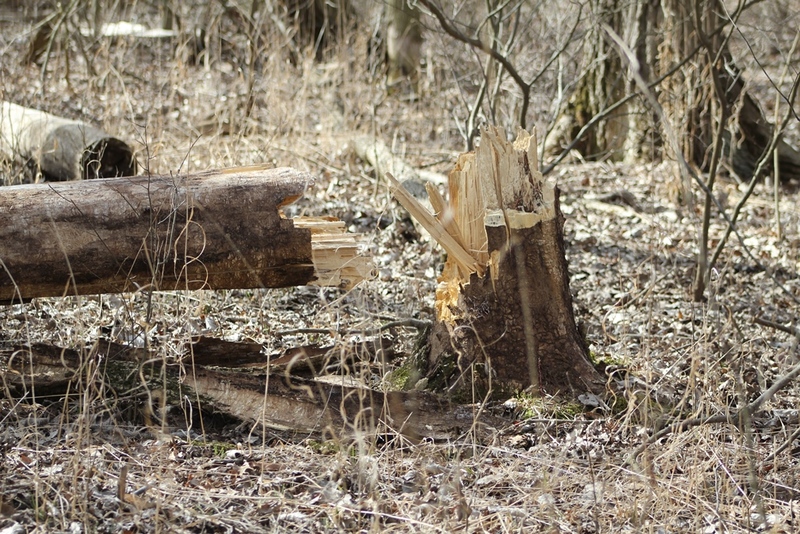 Some trees laying on the ground broke apart early owing to the somewhat brittle nature of dead ash. However, the continual downfall of dead trees that we're now experiencing is largely due to something a bit more subtle. Ash wood is both lightweight and strong which is why it has long been used for baseball bats as well as old, multi-story factory floors. Indeed, beautiful blond-colored ash wood remains a highly durable wood flooring product. However, ash has an inherent fault: the wood has little to no resistance to decay if exposed to the elements. 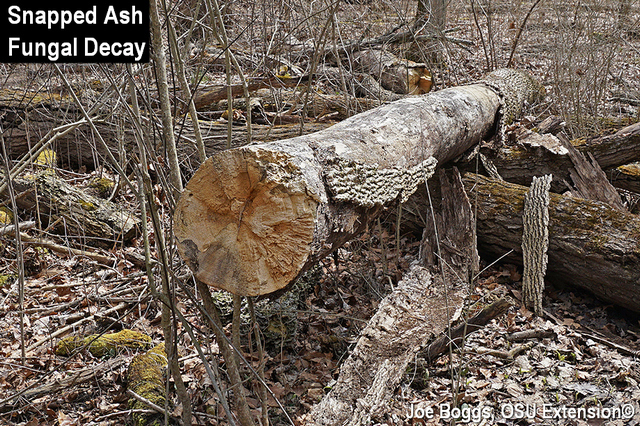 This is one reason ash was not used for fence posts, outdoor siding, porch flooring, or for anything else where the wood could not be protected. Continual failure of standing dead ash trees is occurring as wood rotting fungi digest the xylem fibers that sustain structural integrity. The fungal presence is made apparent by fruiting structures sprouting from the broken ash trunks and branches. Astronomical spring arrives tomorrow foretelling warmer temperatures. 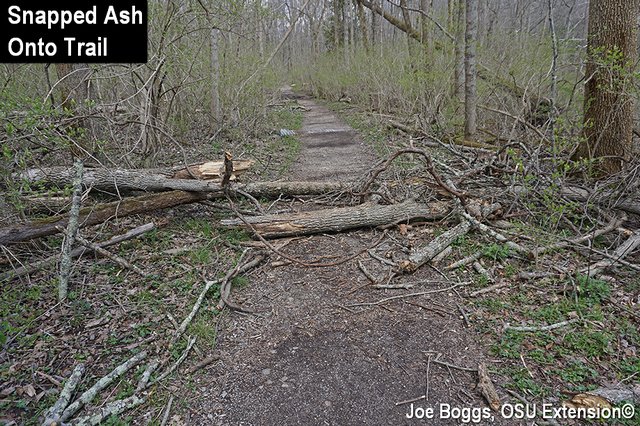 We're not recommending you forgo a hike in a park or nature preserve out of fear of crashing ash trees. However, we do urge caution. Pay attention to the trees around you; particularly dead ash trees if it’s a windy day. 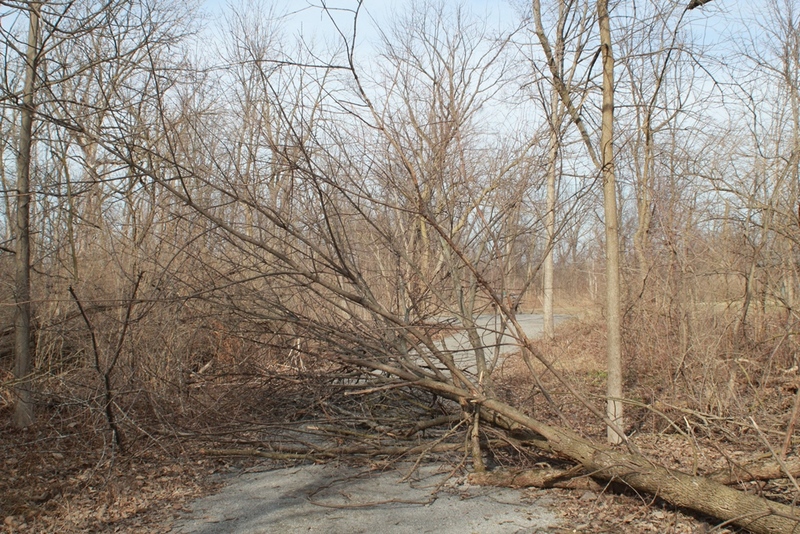 You should also report hazardous trees located near trails to park and preserve managers. Cutting down hazardous dead ash trees protects the safety of visitors. However, taking down unstable dead trees with a chain is not a job for the faint of heart; inexperience can kill. It's highly recommended that the job is performed by experienced tree removal professionals. 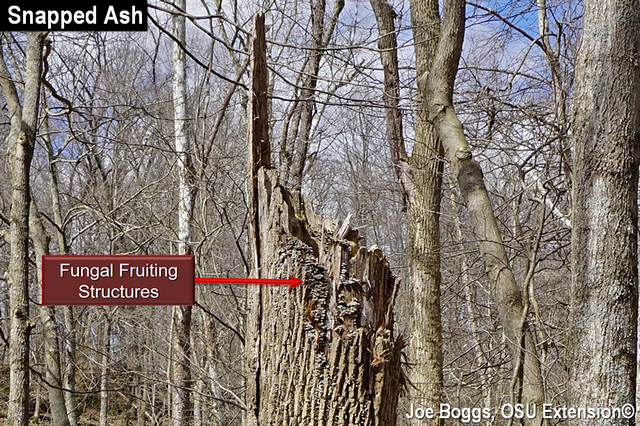 Good or bad, the widespread ravages of EAB in Ohio has given arborists a great deal of first-hand experience. You can find International Society of Arboriculture (ISA) credentialed arborists in your area by visiting the ISA website and searching "Find an Arborist" using your zip code or city. See "More Information" below for the hotlink. 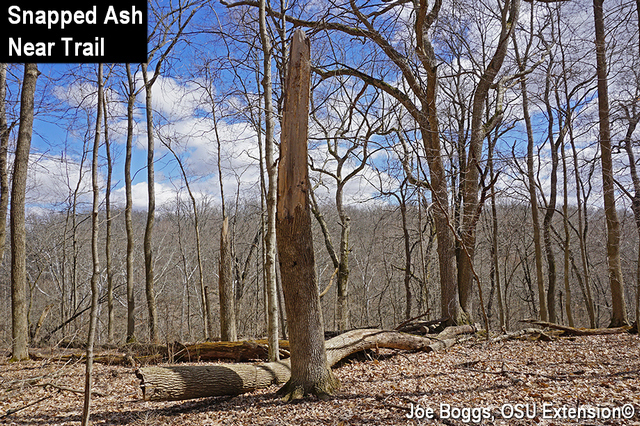 Earlier this month, Joe Boggs authored a BYGL Alert entitled,Ash Breakage: the Hazard Continues (March 19, 2019). 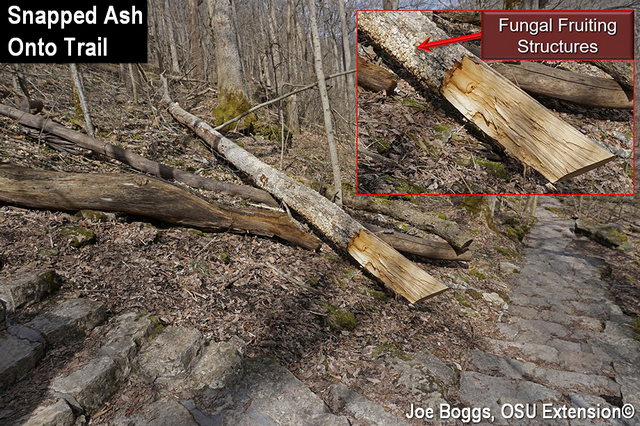 To follow-up with this topic, we wanted to alert you to an upcoming webinar from EAB University calledDead Ash Dangers and Considerations for Risk and Removal. The online presentation will be held on April 2, 2019 at 11:00 am (EST). There will be one more live EABU spring session following the April 2 program. 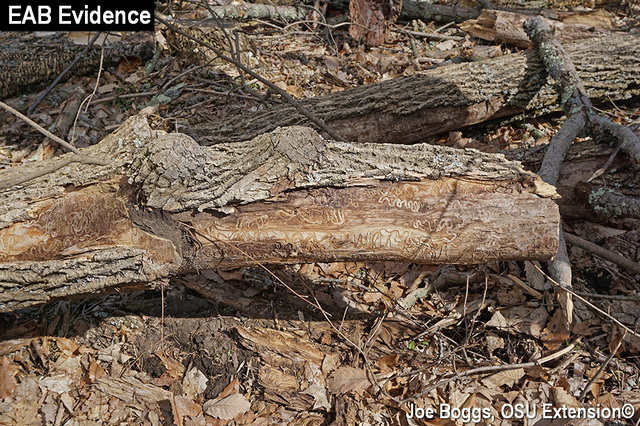 On April 16, 2019 at 11 am (EST), Nate Siegert with the US Forest Service will be talking aboutEmerald Ash Borer: Perspective from a Recently Infested State. While EAB is what some called old news in Ohio, there are folks who want to stay updated on its progress. The EAB invasion has advanced across the Northeast over the last decade, with the first detections occurring in western New York in 2009 and the most recent detections in Maine in 2018. Presently, infestation across the region may be characterized as mix of generally infested areas, newly infested locations, and expanding satellite infestations, with many areas yet to be invaded. The spatial and temporal dynamics of the EAB invasion along the leading edge from New York to Maine will be discussed, including a review of selected management activities, updates on recent changes, and future direction of management and regulatory work in light of reduced funding and potential federal deregulation. Stay updated on EAB and other invasive species through EABU!